← CHOG Convention 2015 Opening Day: Prayer, Praises, Power! Thunder echoed long and loud at Church of God Convention 2015 on Tuesday evening. But it was a sunny day, and Oklahoma City’s professional basketball team did not pay a visit. But the Holy Spirit was present, moved in a mighty way, and prompted two thousand believers to their feet with hands clapping in voices raised. On Tuesday, Shane & Shane got the saints joyfully praising the Lord in both rousing and contemplative worship, as did the Crossings Venue Band. The General Assembly held its opening 2015 session, while several get-togethers and conferences offered mealtime opportunities that fed more than just the body. At worship services spread across the day, Gillian Grannum, Steve Southards, and Sheila Walsh each brought their own distinctive and soul-stirring styles to the stage. Hands were laid upon missionaries as brothers and sisters in Christ prayed and commissioned new opportunities to spread the gospel. Monday’s momentum never let up. The General Assembly convened with a grand introduction of Anderson University’s new president John Pistole, expected to be ratified this week. After another thought-provoking and rallying address from Jim Lyon, general director of Church of God Ministries, resolutions were read. As evidenced by a flurry of activity on Twitter and Facebook, hope for the present and future of the movement was reaffirmed and renewed in the hearts of Church of God people packed into The Venue at Crossings Community Church. Milton Grannum is no stranger to the Church of God. But his daughter may have been an unfamiliar face to some—until today. Today the light of Christ shined brightly through her as she conveyed deep spiritual truths gleaned from the second and third chapter of Genesis. Among many rich statements, she made it clear that Jesus showed us how to love one another in spite of imperfections—Jesus embraced those whom others considered shameful. In the early afternoon session of CHOG Convention 2015, the Church of God assembled to hear how the Lord has used CHOG TraffickLight over the past year to advance the cause of freedom for the oppressed and enslaved. Members of the CHOG TraffickLight team stood up to share stories of how ministries supported by TraffickLight have delivered human trafficking victims and prevented countless others from becoming victims. All rejoiced at the news that you—the Church of God—had already given $518,000 to support the fight for freedom. Finally, in an emotionally and spiritually poignant moment, Anita Naik, who had grown up at The Shelter in Cuttack, India, shared her testimony. 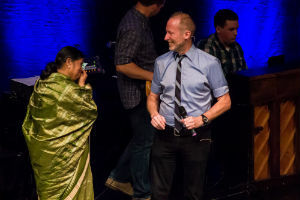 Anita, who had never been outside of India, came to the stage today, accompanied by longtime Shelter leaders Asim and Mamata Das. Today, convention participants will look forward to another General Assembly session, the Heritage Sing-Along, and the big reveal of Change the World grant awardees. 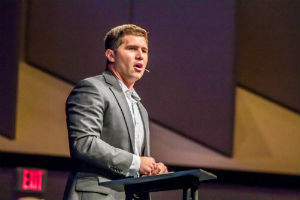 Anita Renfroe, Steve Rennick, and Francis Chan will speak the Word of God, and the Venue Band, Sandi Patty, and Larnelle Harris will offer worship leadership. Check your program book or www.chogconvention.org for more information and event details. This entry was posted in All Church of God, Church of God Convention and tagged Anderson, camp meeting, CHOG, Church of God Convention, NAC, Oklahoma City. Bookmark the permalink.